The title of your blog post plays a major role in the success of a post. It is the title, after all, which compels users to click on the blog post and read it. In addition, the title of a post plays a significant role in a post’s search engine ranking. A good title is one which is optimized not just for readers, but also for search engines. If you are using WordPress, you also have an option to write two different titles for readers and for search engines. I usually write one title for readers (on the blog) and then I write a different title for search engines (SEO meta title). Finally, I write yet another title for social media platforms. This is a winning combination which makes sure I get the maximum amount of clicks from every platform. In order to achieve optimal results, you need to have a “catchy” title for your blog post – one that inspires the reader of the title to want to click and read the article. Should you need help creating titles, consider the following (totally awesome) list of title generators which will help you create catchy, inspiring, popular blog titles based on your keywords. I suggest that you bookmark them and use them frequently to guarantee you are getting the most clicks for your posts. I have talked about Hemingway in my earlier post of 100+ blogging tools. It is very easy to use headline analyzer and offers helpful tips to improve your writing. Do you remember the premium WordPress SEO plugin: “SEOPressor“? Well, now they have come up with a free title generator which will helps you generate catchy and creative titles for your blog posts. The tool is easy to use. All you need to do is to add your keyword, select the keyword type, and it will generate many possible titles from which you can choose your favorite(s). This is a popular blog idea generator tool which helps you to generate titles for your blog posts, or you can choose to use it to generate new topic ideas. Simply add your keyword in the text field and it will show you titles or topics for you to choose from. This happens to be one of my favorite topic generator tools. There is a saying – “less is the new more“. Well this title generator is the complete opposite! This is a great title generator which throws out lots of ideas in one shot, but you may be overwhelmed by the number of ideas it generates. 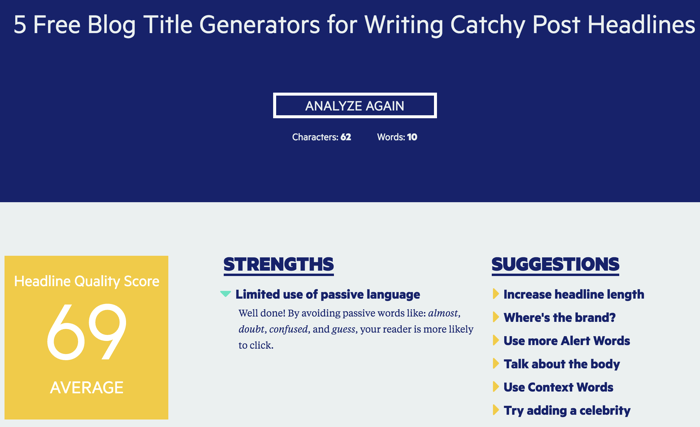 The good thing about this generator is that it generates titles based on different categories which will help you identify the right title for your blog post. 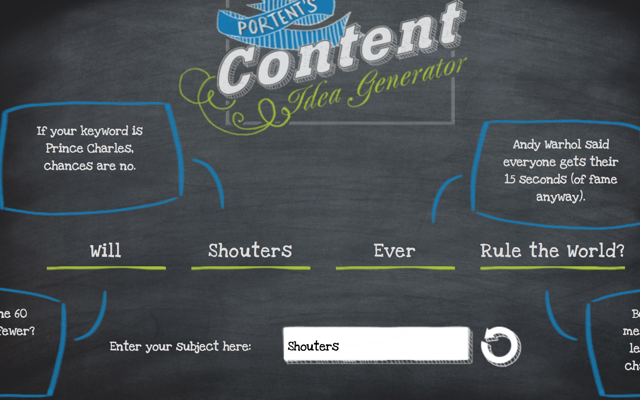 This is the first content idea tool I used and I’m pretty sure you will love it. This generator is so easy to use and it generates ideas which you will be compelled to use in your blog posts. Simply add the keyword, and hit “Enter”. If you don’t like the suggested title, simply hit the “Refresh” button next to the keyword field. At times you may just need to replace one word from a generated title to make it perfect for your blog post. 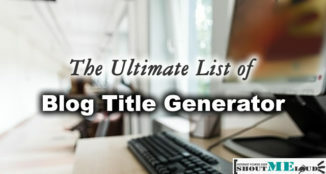 While conducting my research to identify some of the best title generators available, I landed on this excellent tool which I’m surprised I had not heard of previously. The design of this tool is so elegant and the ideas it generates are so intuitive. I’m sure it will help you to create some very compelling titles. One of this generator’s best features is the fact that you can generate a title and save it so you can go back and compare all the titles you’ve generated. Also, in one shot you can generate numerous titles which you can use for future articles on your blog. All in all, this is an amazing article title generator which you should definitely bookmark. 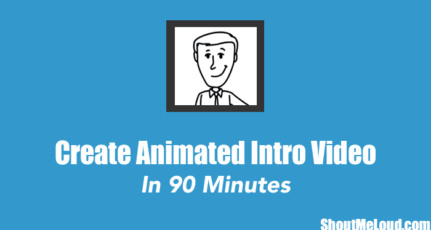 I’m sure it will help you to create some very compelling titles. If you need to generate viral post titles, this is the perfect tool for you. This tool randomly suggests post titles from the UpWorthy site, and then you can make any necessary or desired changes in the title to suit your particular tastes. Remember, UpWorthy is a social media viral site. All of their titles are well researched to get maximum traction on social media platforms. These are some of the best title (and topic) generators which are readily available to you. The purpose of these tools is to help you to generate titles (and topics) which are specifically designed to bring more readers to your blog. If you have a team of authors, be sure to share these tools with them as well! What are some of your techniques for writing great post titles? If you know of any other title generators, let me know via the comments section below. If you find the information in this post useful, please share it with your friends and colleagues on Facebook, Twitter, and Whatsapp. This article is very helpful. Its helped me really. 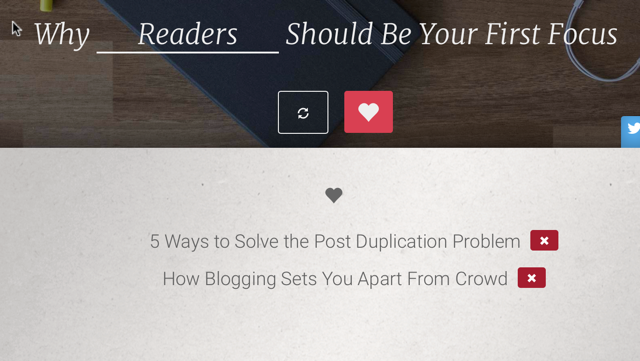 I was struggling to find a suitable tittle for my blog posts, but hub spot helped me. Also i want to ask that when can i go for adsense account,i mean after what time period i can start addings ads to my blog. Thanks for Information about Generators & Analyzer. Your Article is impressive and very informative. I am now regular visitor of your website and bookmarked it. hello harsh i really appreciate your work towards educating other fellow bloggers.. and this post is very useful to me for generating blog titles…. thnx for posting this useful article..
Hi Harsha, Thank you for this post, such title research tool gonna make it less stressful for sure. I was not even aware of the existence of any such tool, but thankfully many do exist with lots of downloads. After going through your post, I did some more general google search and found few more not free but worth buying. This is something I am seeking for. Like I always confused with the title with my blog post. It consume more time and red tea. Thanks for this nice tool I will check it out and let you know how effective is for me. Hello Harsh , I have been checking these sites since a week after reading this article and I personally found blogabout best for my blog, thanks for keep us updated with such nice infos. Glad that it helped you. Thank you for the feedback. Thanks for Information about Generators & Analyzer, , I am currently consistent guest of your site. Your post is exceptionally instructive. This article is extremely useful. Its helped me truly. First of all than for the good piece of information. Sometimes, I use “Title Generator by TweakYourBiz” and found it helpful. However, still my site doesn’t perform well when it comes to listing it on first page of google. can you please suggest me some tips & trick for good seo. So that my blog can also be listed at top of the search results. thank you for giving knowledge about this new topic title generator i was totally unknown about this topic . i am happy that i am visiting here daily and get some new topic information. Thanks for providing such a good information. I think, I can drive more traffic to my website using these tools. Thanks for compiling this list Harsh. I currently use BlogAbout title generator and I lurv it!!! Thanks for sharing great title generator tools it’s really awesome tool to create our blog title as an eye-catching. 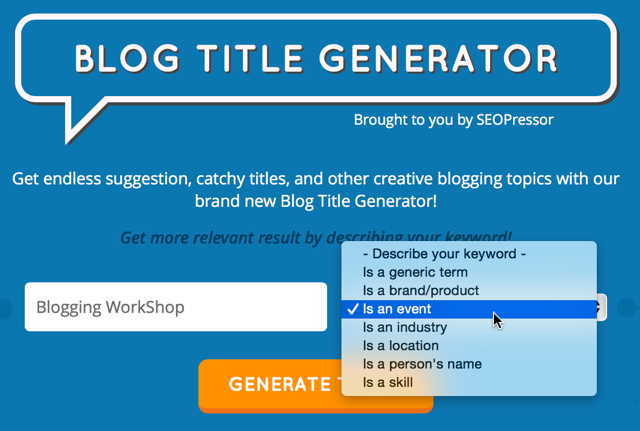 Nice bunch of tools for generating blog title. pretty interested in testing all of them right now. Thank you so much, Hemingway Sharethrough is very easy to use, I liked this tool.